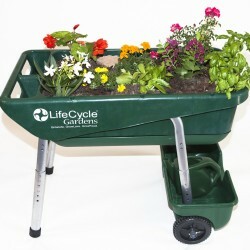 Tappin’ Roots | Global Garden Friends, Inc.
View Cart "Garden On Wheelz" was successfully added to your cart. 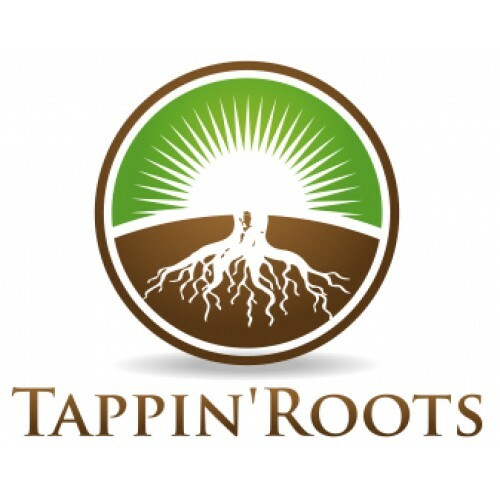 Tappin’ Roots is a nutrient which provides the vital building blocks required for optimal growth in a readily accessible form that promotes healthy root systems and strengthens plants natural functions. 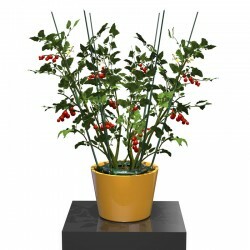 Maintains a flourishing root system throughout the plants entire life cycle. With Indoor gardening environments Tappin’ Roots usually cuts veg time in half. 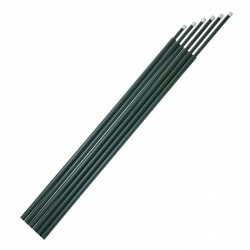 It’s recommended to be used as a one-part nutrient, or in conjunction with your normal feeding regimen. You should see visible results within 3 days, or even sooner with foliar feeding. 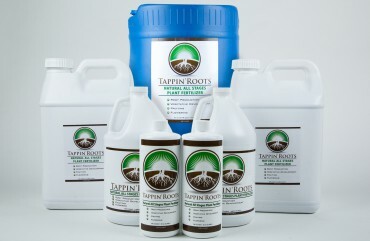 Tappin’ Roots is a 30-year old blend of wild harvested plant extracts and naturally occurring micronutrients that provides your plants needs without the harmful side effects of chemical fertilizers. Combining knowledge from the past to present day horticultural techniques. 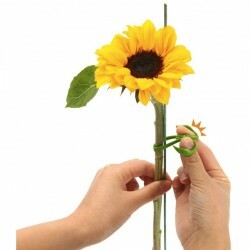 Tappin’ Roots can be used at any stage of a plant’s development, from cuttings until flush. 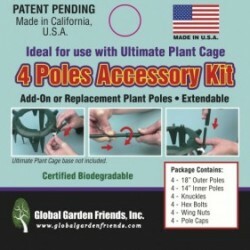 It is compatible with any soil (root drench), hydroponic, or aeroponic system and will not clog any drip feed systems or misting emitters. You should see visible results within 3 days, or even sooner with foliar feeding. 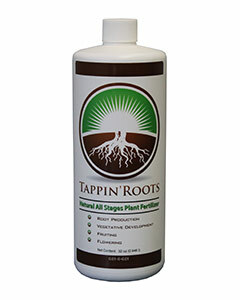 Tappin’ Roots is pH neutral. 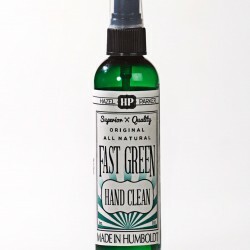 So, the gentle yet powerful formulation will never burn plants and works to prevent nutrient lockout at the root level. Tappin’ Roots is excellent for cuttings. 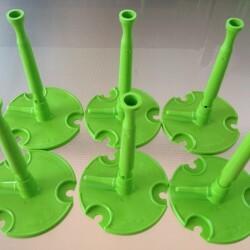 It is also very easy and versatile to use, just foliar feed until root nubs appear, then add to the growing medium or reservoir, as directed on the labeling. Within seven days, stocks will thicken, multiple sets of leaves will appear, and roots will emerge. 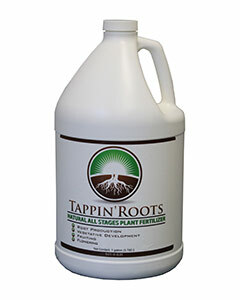 Tappin’ Roots provides the vital building blocks required for optimal growth in a readily accessible form that promotes healthy root systems and strengthens plants natural functions. 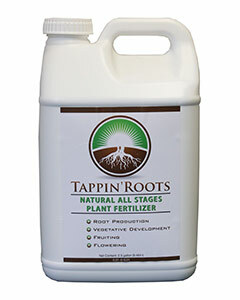 Tappin’ Roots directs nutrients where plants need them most, throughout the various stages of the plants life cycle, encouraging strong cellular structure with heavy blooms and hearty fruits. The wild crafted ingredients of Tappin’ Roots are hand harvested using ecologically sustainable methods. Each batch is processed using no chemicals producing a 100% natural product.